Reliable and Compact panels on either side of the arm chair, fitted with highly advanced master controllers which are light in operations and light smooth in functioning combined with high degree of precision to ensure performance. Other vital components of proven design selector switches, indicating lamps, illuminated push, buttons & foot switches etc. Ergonomically design to ensure greater safety and comfort, more effective results,higher productivity low payback period. Complete unit can rotate up-to designed angle operator. Adjustable chair according to the height of the operator. Smooth master controller for fatigue less operation. Provided with push button, including lamps etc. 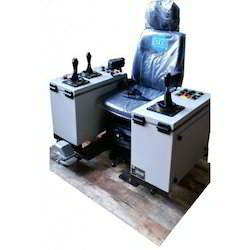 "KAKKU" Make Heavy Duty Ergonomically Designed Arm Chair Control Unit With Operator Chair / Collapsible Chair and Control Desk Mounted Together With Fixed Base. Mounting arrangement for HMI (Human Machine Interface). Looking for “Arm Chair Control Unit”?